This face is an NLE exclusive digitized by customer request for Kathy. a must see in our gallery! 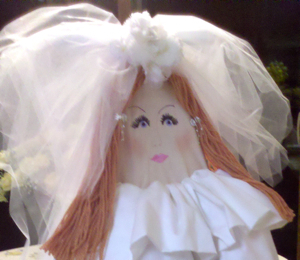 Bride's face by customer request is an NLE exclusive, digitized for Kathy who makes these beautiful "Brides". Each bride is actually an ironing board adorned with bed sheets to create the gown for this beautiful and unique gift. 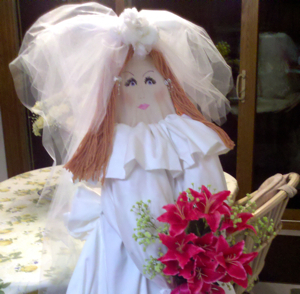 Kathy reports that many brides-to-be so love their new ironing board brides that they cannot bare to take them apart ! (That's one way to get out of ironing!) This unique gift makes a wonderful focal point for bridal showers too!